2012 Vauxhall Astra review | What Car? The Vauxhall Astra five-door hatch and Sports Tourer models have been given a bolder, more aggressive appearance as part of a mid-life update. The changes include a new front grille, and restyled front and rear bumpers inspired by those on the three-door Astra GTC. However, mechanical upgrades are limited to a new overboost function for the 1.4-litre turbo petrol engine and a new range-topping Biturbo diesel. 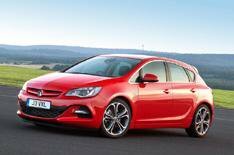 Vauxhall is also offering several new optional extras across the range. Astra buyers can now have a 750 Driver Assistance Pack, which includes Forward Collision Alert, Lane-Departure Warning, Traffic Sign Recognition and a Following Distance Indicator. A Rear View Camera Pack, Winter Pack (heated steering wheel and seats) and LED daytime running lights can also be specified. In addition, there are three new exterior colours and the Astras standard DAB radio has been upgraded to a DMB (Digital Media Broadcast) system. Prices are largely unchanged, with the entry-level hatchback (an 86bhp naturally aspirated 1.4 petrol) costing 12,995 and the cheapest diesel (a 94bhp 1.3) priced at 17,980. The Biturbo hatch costs 24,095 and the Biturbo Sports Tourer is 25,110. Whats the 2012 Vauxhall Astra like to drive? Thanks to its new overboost function, the 1.4-litre turbo engine can produce an extra 14lb ft of torque for brief bursts to help with overtaking, but it still feels surprisingly weak. The new BiTurbo engine is much stronger, because it has a small turbo that spins up quickly to give good low-speed responses, and a larger one that joins in later to provide lively mid-range performance. Unfortunately, refinement disappoints; the Biturbo engine transmits quite a lot of vibration through the pedals and sounds gruff under acceleration. In other respects the driving experience is unchanged, which means the Astra has a supple ride and plenty of grip. However, it doesn't handle as well as a Ford Focus or VW Golf, because its steering is less precise and theres quite a bit of body roll. The Biturbo that we drove was fitted with Vauxhalls Flexride adaptive suspension system (a 790 option), which lets you tighten things up at the touch of a button, but comfort suffers and the car still doesnt feel particularly sporty. Whats the 2012 Vauxhall Astra like inside? Vauxhall is offering some new interior trim options, including an all-brown colour scheme, but otherwise its a case of as you were. The Astras boot is one of the biggest in the class and theres space for four six-footers in the cabin. Whats more, the cabin is a pretty appealing place to sit, thanks to chrome detailing and a swoopy dashboard design. True, some of the plastics arent as tactile as they look, but everything feels like its built to last. Youre more likely to be frustrated by the fussy centre console layout and compromised visibility. The new Biturbo model undercuts its closest rival, the Golf GTD, by almost 1500, but it wont hold its value as well and is still a seriously expensive Astra. Some of the cheaper models in the range make far more sense. Unfortunately, these cost more than equivalent versions of the Focus and Golf, let alone the new Hyundai i30 and Kia Ceed. You wouldnt feel hard done by if you were handed an Astra as a company car, but it remains a good small family car rather than a great one.